A cultivar of Prunus avium L. ‘Large, roundish, inclining to oblate. Skin at first of a red-cornelian colour, but gradually becoming dark red, and ultimately almost black, as it ripens. Stalk about an inch and a half long. Flesh red, tender, juicy, and richly flavoured, with a fine, subdued acidulous smack. Beginning of July.’ [Hogg – Fruit Manual p.58/1860]. ‘Although it has been cultivated a considerable time in this country, I do not find it mentioned previously to Ray, in 1688.’ [George Lindley – Orchard Guide p.146/1831]. A good to very good quality mid-season cherry which seldom cracks. ‘This is certainly one of the best dessert cherries, when all of its properties are taken into consideration.’ Don. Grubb. 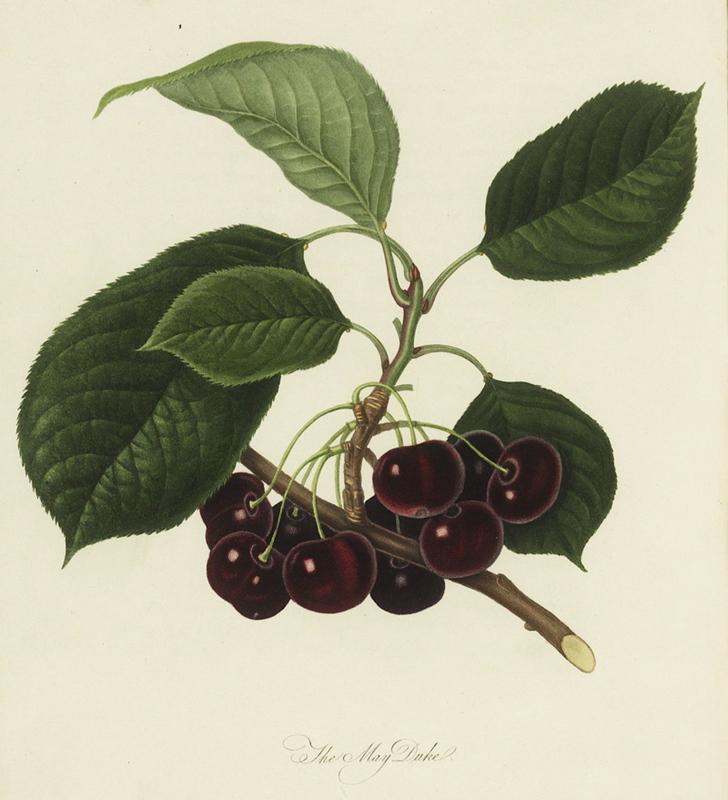 ‘This Cherry is, in the estimation of the market gardeners in the vicinity of London, better adapted to produce an early supply of fruit for Covent Garden than any other; and although the trees exhibit evident symptoms of debility, particularly in cold or damp situations, it still possesses strong claims to commendation. In the neighbourhood of Brentford, and Isleworth, it is extensively cultivated, and under skilful management is abundantly productive, and its fruit excellent. It is also, perhaps, the best variety at present in use for forcing, as the fine early crops of its fruit, which are annually produced in the Royal Gardens of Kew and Hampton Court sufficiently prove. The leaves are moderately large, broad, terminating in a narrow point, sharply serrated, of a very dark green on their upper surface, paler beneath; petiole from 1 to 2 inches long, thick, tinged with red. The fruit is usually produced in clusters of ten or twelve; large, roundish, flattened at both extremities, sometimes broad heart-shaped; of a very deep brownish red colour, approaching nearly to black when ripened in a favourable exposure. Flesh soft, juicy, and sweet, enlivened with a pleasant acid. Stone small, readily quitting the flesh. Footstalk rather short, frequently two or three together on a short support. This variety ripens in June.’ [PL vol.1, pl.28/1818]. PB pl.VII/1812. Listed in all published catalogues [Cherry no.1/1843].